Gott and Cohen in Madison Co.
“Madison County Project: Documenting the Sound” examines the tradition of unaccompanied ballad singing in Madison County, North Carolina and how both documentary work and the power of family and community have influenced that tradition. The film focuses on John Cohen and Peter Gott’s film and recording work in Madison County in the 1960s as well as the voices of today’s ballad singers such as Sheila Kay Adams, Donna Ray Norton, Denise Norton O’Sullivan, and DeeDee Norton Buckner. Peter Gott came to Madison County, NC, in pursuit of traditional banjo music. He happened to hear a recording of Madison County banjo player Obray Ramsey playing “Pretty Polly” and the traditional tune “Little Maggie.” Gott, in turn, inspired musician and filmmaker John Cohen to come to Madison County. Cohen’s interest in the singers of Madison County inspired him to produce a film entitled “End of an Old Song” about the legendary Dillard Chandler (1907-1992). Chandler, one of a long line of ballad singers, is said to have had one of the best voices for ballads in the world. Cohen describes Dillard Chandler’s bewilderment when, in 1963, Cohen asked if he could record him singing ballads. “There was this big wall of silence–not resistance…I was there an awfully long time trying to explain to him why he should sing for my microphone…There’s something about this music–it would be so good if other people could hear it.” From this account, we can see that clearly, Dillard Chandler had never anticipated the interest in his singing from a wider audience. This outside interest in the people of the ballad and traditional music scene eventually led to some unfortunate misunderstandings about the use of the recordings. As singers began to perform for festivals, strangers told them about seeing or hearing a recording of them. This revelation led to the belief that others were making money from their talent, without sharing in the financial benefits. 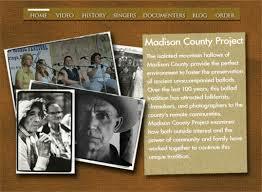 In fact, while Cohen’s work may have given the Madison County singers much deserved recognition and external respect, his efforts were focused on the documentary aspect of this culture and its traditions, rather than on reaping commercial profits. The conflict finally came to a head in one incident. Peter Gott and John Cohen frequently spent time at Doug Wallin’s house. One day Doug explained to them that they were welcome to come, but that he didn’t want any more recording. OTW: Before the New Lost City Ramblers era, had you done field recording? JC: At that same summer camp, the cooking staff were all from South Carolina, except for one guy who was from Queens. They would sit around and sing at night, when the campers weren’t around. I would hear songs that intrigued me, and amazed me. In 1949, my brother and I each bought a wire recorder. (And somewhere I have a recording of a guy named Ike Davis singing Gonna Move to Kansas City. I would love to hear that again!) But here was an example of my reaching outside my immediate culture of going to record stores, by instead actually going to people. In the early 1950’s, I was at another Catskills camp called Camp Woodland. It was the first place I knew of that took city kids out to meet all the local farmers and hear music from them. The camp put on a festival once a year of all the local people singing. There’s a rich, rich tradition of music in the Catskills. They had a square dance every week with local people who played fiddles and accordions. For the two years I was there, that was a big eye and mind opener. One of my campers there was Richard Bauman, who eventually became the head of the American Folklore Society. He introduced me once as the first person to show him how to play an E chord. The first time I heard Earl Scruggs-style was at the end of that camp, played by Roger Sprung, who was in 1949 just beginning to play it. And then I started really listening to the records. So by 1951, say, I was conscious of the idea that there was a living music out there. I was also listening to radio station WWVA, which you could get late at night and hear this interesting country music. 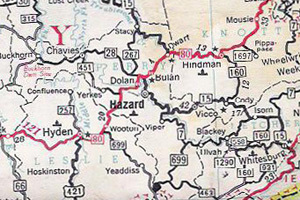 OTW: Had you traveled in Appalachia or the South much by then? JC: In 1952, I hitched South on my romantic notion of that being a way to get to the music. I remember the second night at a gas station in Virginia, midnight. Blaring all over the countryside via radio was Foggy Mountain Breakdown. I had arrived. I was desiring then all that I didn’t know how to do. I stopped off in Washington at the Library of Congress, the folklore division, and said: “I’m heading towards Asheville [NC]. Who should I see there?” They told me to see Virgil Sturgill and Bascom Lunsford. I knew a couple of records by Lunsford, so I thought that would be good. OTW: I read somewhere that Lunsford disliked Seeger’s liberal views and that he was phobic about northerners—especially New Yorkers. JC: It was as though I had pushed all the wrong buttons. I knew that my desire to get to hear the music in its context rather than just off the records was important nonetheless. OTW: You’d been playing banjo by then? JC: Yes. The first 5-string I bought was at Williams College, around 1949. I was able to buy a banjo in North Adams for nine dollars—but I didn’t know how to play it. One time in the snow, I’m walking across campus with it, no case or anything. Some workman said, “Oh, you got a five string there, huh?” And they picked it up and played something, and I had never heard anything like it. It was neither frailing not Pete Seeger style. I think it was minstrel style, or something. I had the banjo, but I couldn’t play it. I could only remember what I’d seen of Woody Wachtel’s playing. I had heard Pete Seeger but I didn’t know how he played. And so I started working out frailing. In 1950, in the fall, I hitched up to Putney School in Vermont. Some guy asked me to visit. Peggy Seeger was a student there. We started talking and that’s when I first got my copy of Pete’s mimeographed book. John Cohen: The real event was in 1948. I worked at a summer camp, where I had in various years been a camper, a waiter, and then a junior counselor. By some wonderful twist of fate, the old couple who did the interviewing for the camp took out an ad in the “New York Times”: “Wanted: Counselors for progressive camp.” Now, their thinking was progressive education, but for a lot of people, that meant the Progressive Party (1948 was the year of the Progressive Party, the third party, with Henry Wallace running against Truman). So you had people from Margot Mayo’s square dance group, five or six counselors all who were into Progressive Party thinking, and Irwin Silber, who later [in the early 1950’s] helped Moe Asch turn “People’s Songs” into “Sing Out!,” and Irwin’s sister, a very radical Communist, was there because they all had responded to that ad. They were very interesting people. Under his instruction, I made a 5-string banjo before I even learned how to play it. Woody did the straight old drop-thumb fretless banjo style with so much drive. That and the folk and square dancing from all those other folks—it was a very big moment. It actually merged traditional music and politics for me. OTW: Had they played them at that New York radio station? JC: Yeah, WNYC. When I heard Cluck Old Hen done by Al Hopkins and the Bucklebusters, that was the first time string band really hit me. It was such a rich sound, and it awakened all that earlier stuff. It came at you from every side: dancing, and rhythm, and you could hear all the instruments, guitar, fiddle lead, a banjo break, a ukulele part. It appealed to me and it definitely appealed to all those who could hear its richness. Eventually that became the mission of the New Lost City Ramblers—to get more people to listen to it. Woody also showed me, later on, how to play Shady Grove, and he tuned the banjo like Rufus Crisp did, with the bass string up to F. The tuning was gFGCD. I was so intrigued with that modal sound which I never had identified as such. Then I got a banjo, and I could do that. Shortly after that, around 1950, Pete Seeger’s first edition of “How to Play the Five String Banjo” manual came out. He noted that “Woody Wachtel reports there are 15 or 16 ways to tune the banjo.” That intrigued me, and I then spent years and years trying to find out all I could about banjo tunings. Just the quest for tunings became an important element in all the field recordings I’ve done—because it turned out to be something I could talk about to country people. Later I started a fairly intensive project of trying to catalogue all the tunings I could. I’d get people like Stu Jamieson and Ethel Raim, who would give me lists of 60 or 70 tunings, and they’d mention a song you never heard of and an artist you never heard of. But there were no recordings to go with those, and I would say, “I’m not going to use that. I want to hear what it sounds like. I want it to be verified.” I never finished that project because the list got very, very long. 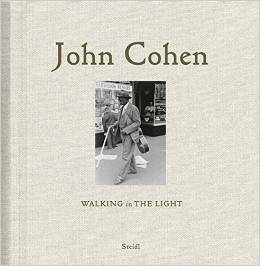 John Cohen: My parents had been doing folk dancing even before I was born, back in the 1920’s, so, they listened to folk dance records. They’d had square dancing in the city, in Sunnyside, Queens. So that sound, that feeling of warmth and being part of a down-to-earth thing, contrasted with the pop culture then. But the music was always there, even before I was born. My parents sometimes had Margot Mayo come to the folk dancing events, and she taught longways and square dances. JC: Margot was from Texas, but she came from Kentucky before that. Her uncle was Rufus Crisp, the old banjo player. She made recordings of Crisp for the Library of Congress. And she knew people like Stu Jamieson, who did wonderful things with the banjo. He and Woody Wachtel were her prime students. In New York City she was Arlo Guthrie’s teacher when he was a kid. She brought people together—Woody Guthrie, Josh White, whoever she could find—and put on concerts with them there. OTW: Some authors look askance at your being a city fellow learning and playing Appalachian music. Would you want to examine that? JC: [Pause.] There was a book about folklore, about folklorists and how they all got started. [“Transforming Tradition: Folk Music Revivals Examined,” edited by Neil Rosenberg] A woman named Ellen Steckert wrote that it was absurd “to see John Cohen from East Egg, Long Island, learning old-time.” It hurt to see that in print. She stated that several times—and then Neil Rosenberg, who wrote the introduction to the book, he mentions it again. It got me wondering, not so much about the “absurdity” of learning old-time music in the suburbs, but why she was using me as a whipping boy for what we all did, when she had been there with me at the time. What really troubled me was that I didn’t learn old-time out in the suburbs. My parents were disposed toward traditional music. I wasn’t born into the Seeger family or in the mountains of Kentucky, yet that music is a very important part of who I am. When I heard Bob Atcher sing Barbara Allen, it really spoke to me. Not through my parents—the song was speaking right to me, something wonderful and strange as a story like that. A Perry County icon and national folk music legend turned 90 years old this week past weekend, only a couple weeks after she was honored during the Appalachian Winter Homecoming in Hazard. Jean Ritchie has spent decades writing and preforming music that has kept the musical traditions of the mountains alive. She grew up in the Viper community a few miles south of Hazard as the youngest of 14 children. The family all preformed music and memorized songs as they worked, and would often times perform at churches and festivals. Ritchie was first recorded in the 1930’s by acclaimed folklorist and musician Alan Lomax while he was recording songs for the Library of Congress’s Archive of Folk Song. The Singing Ritchies were recorded along with hundreds of other folk singers. Ritchie attended Cumberland College and the University of Kentucky, graduating with a degree in social work. She moved to New York where she began working at the Henry Street Settlement School. While in New England, she met several musicians and started playing her old folk songs again. She also met George Pickow, who would later become her husband. She and Pickow have two sons, Peter and Jonathan. Ritchie began playing and recording regularly and brought much attention to a little known instrument, the lap dulcimer. She, Pickow, and Pickow’s uncle Morris Pickow, began a workshop making dulcimers in Brooklyn. Ritchie would tune them and Pickow would finish them. Ritchie believed that there was going to be a dulcimer revival, and she was right. While the instrument remains obscure in mainstream circles, it has become very popular in folk music. According to Dean Osborne, director of the Hazard Community and Technical College’s Kentucky School of Bluegrass and Traditional Music, it is because of Ritchie’s influence that the dulcimer has become such a large part of folk music. “She is in the top three of dulcimer players in terms of what they have done for awareness of the instrument,” said Osborne. She went on to create hundreds of recordings and write many songs. Several of those songs were written under the pseudonym Than Hall, her grandfather’s name, because she felt many of her songs, particularly about coal, would be taken more seriously if they were written by a man. As it turns out, this may have been true. One of her most well-known and frequently covered songs, the “L & N Don’t Stop Here Anymore,” was written as Than Hall. Osborne said that he believes one of the reasons Ritchie’s music is so often covered is because of how timeless and iconic it is. “Her music is honest and from the heart,” he noted. Another reason she has been able to become truly iconic is her ability to bring the music of the region outside of the mountains, Osborne continued. While there were many emerging folk artist during the 1940s and 50s, Ritchie was able to rise above because of her willingness to collaborate with many of the greats and take the music to places it had never been before. He compared Ritchie to a modern figure in folk music, Alison Krauss, for her ability to bring the music of Appalachia to the world. “While there is nothing wrong with playing around your home, she was able to bring our music to major venues,” Osborne said. Ritchie’s music covers many different facets of her life, from the songs she and her family sang while working in the fields to songs about the coal industry and religion. She kept her music traditional, with most of it being the way it would have been sung at home with no accompaniment. She would play guitar or dulcimer in some of her songs. Another way she kept old traditions alive was by recording many of the Old Regular Baptist hymns that she grew up with. They were recorded as they were sang, lined out one line at a time. Osborne said that it was her voice that made these recordings work. He called it just perfect and sweet. Over the years, Ritchie has performed on some of the grandest stages in the world including Carnegie Hall and Royal Albert Hall. Her and her husband’s photographic archives and Irish music have been purchased and are displayed in the National University of Ireland. She was awarded with a Rolling Stone Critics Award in 1977 for her album None But One. In 2002 she received the highest honor in the folk music world, the National Endowment For The Arts National Heritage Fellowship. Among all of the musicians from the mountains, Osborne said that Ritchie stands out because of her honesty in her songs and ability to cross boundaries with her traditional music. Osborne was a part of the selection committee that chose her to be in the first class entered in the Kentucky Music Hall of Fame in 2002. “She is in a class all her own,” he said. Ritchie’s career has spanned from the late 1940s through 2009. She continued preforming until she suffered a stroke in Dec. 2009 that affected her communication. She was able to make a great amount of recovery and begin speaking again in 2010. From her humble beginnings sharing a bedroom with her nine sisters and signing in the fields, Jean Ritchie has been regarded as a national treasure for preserving the music of the mountains and bringing folk to the world. ‘There is no eye: music for photographs’ is a companion CD to John Cohen’s recent book of photographs of musicians There Is No Eye (Powerhouse, 2001). Many – though not all – of the tracks on this CD are taken from his own recordings. 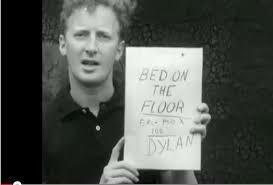 Bob Dylan’s Roll On John is taken from a 1962 radio broadcast. Officially issued here for the first time, it has, in fact, appeared on a number of underground tapes. On first hearing I was quite surprised how well Dylan sang the song. Subsequent hearings, however, show a shallowness when compared with the source recording of Kentucky singer Rufus Crisp (Folkways 2342). John Cohen has spent some considerable time documenting the music of eastern Kentucky. Mountain Music of Kentucky (Smithsonian Folkways 40077) first introduced us to the singing of Roscoe Holcomb, among others. When Roscoe’s solo album High Lonesome Sound (Smithsonian Folkways 40104) was reissued on CD I was disappointed that his haunting Man of Constant Sorrow had been omitted. Now we know why. It’s here! Thank God! Hallelujah! John prints a number of comments about Roscoe Holcomb’s singing from other writers. I especially like this one: ‘A voice that bypasses the head and shoots straight for the soul’. I have to say that it came as something of a shock to learn that Roscoe had originally learnt the song from a recording by Ralph Stanley, his delivery sounding as though he had been born with the song already implanted in his mind. One of John Cohen’s films is of Kentucky musicians. Also titled The High Lonesome Sound, it focuses primarily on Roscoe Holcomb, although Bill Monroe and his Blue Grass Boys are also seen performing their version of John Henry, which is likewise included here. It’s a high-powered performance, one which contrasts sharply with the almost sedate performance of the Baptist song Come All You Tender Hearted sung superbly by Carter Stanley. Other mountain – Appalachian, of course – recordings include Doc Watson and his father-in-law Gaither Carlton singing and playing Hick’s Farewell, Sidna Myers playing the exquisite clawhammer tune Twin Sisters and Hazel Dickens and Alice Gerrard performing a tight bluegrass version of TB Blues. The 1964 recording of Paloma Blanco, performed by a Peruvian stringband, is exquisite. It is preceded by the New Lost City Ramblers (John Cohen, Mike Seeger and Tracy Schwartz) playing a version of Buck Creek Girls that John had previously collected from Kentucky banjo player Bill Cornett. What strikes me is how similar the New Lost City Ramblers sound to their Peruvian musical cousins. The tunes are, of course, dissimilar, but, the manner of playing – the philosophy behind the playing – is clearly related. In 1948, at the age of sixteen, John Cohen first heard Woody Guthrie’s Dust Bowl Ballads at summer camp at a site called Turkey Point, north of New York City. The music entranced him. Guthrie’s ballads and other albums of old songs and fiddle tunes sparked not only Cohen’s fascination with old-time music, but also his rebellion against mainstream culture. 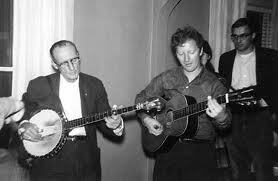 At the same camp, Cohen also got an introduction to Kentucky mountain music and learned how to both build and begin to play a banjo. Woody Wachtell, a camp counselor, had been to Kentucky with Margot Mayo, founder of the American Square Dance Group, whose uncle, Rufus Crisp, was a banjo player from Allen, Kentucky. Crisp had recorded for the Library of Congress during the 1940s and ’50s. Wachtell and Mayo made recordings of Crisp who, in turn, taught Wachtell about the banjo. Wachtell, as Cohen remembered, “conveyed such joy with his music . . . it was astounding to me . . . it had the feeling that it was something that I could do.” Cohen also listened to music collected by John and Alan Lomax in the southern mountains while attending camp. 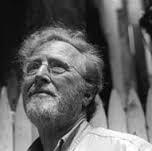 Cohen’s sense of alienation persisted when he attended Williams College in 1950. Fraternities dominated the school’s social scene and he met no one who shared his fascination with folk music. He found solace playing the banjo in his room and listening repeatedly to the Library of Congress recordings in the school’s library. At night, he tuned his radio to WWVA and listened to country music broadcasted many miles to the south. The sounds seemed alien, but deepened his fascination for Appalachian music. “The songs spoke of Honky Tonk life and cheating wives and husbands on the one hand, and of the longing for home, farm and tradition, on the other.” Enraptured, Cohen spent his first summer after college hitchhiking south to experience the music firsthand. When one of his rides stopped for gas somewhere in Virginia late at night, Cohen noticed the bugs swarming around the station’s lights as a radio outside blared Flatt and Scruggs. He had heard Flatt and Scruggs before, but never so close to the source. They hit him hard.